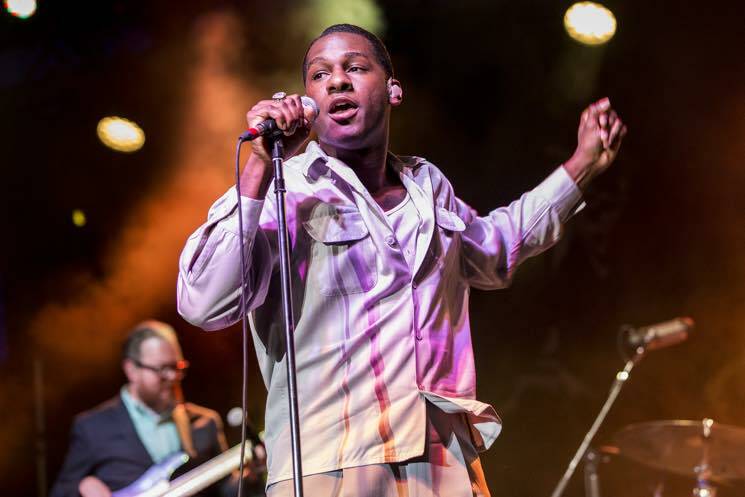 For the final performance of Saturday evening (August 12), Leon Bridges took to the Main Stage of the Edmonton Folk Music Festival to let loose, sharing his nostalgic '50s and '60s-inspired soul music. Singing and dancing, the 28-year-old from Fort Worth, TX, enticed his audience with high energy and an infectious stage presence that got everyone from children to the elderly dancing their hearts out. Leon was electric for the duration of the performance, showcasing his bright personality and dynamic musical ability. Audience members were mesmerized by the singer's light-hearted croon and affectionate tone, especially during more tender and emotional songs. Bridges' voice served as a vessel to take the crowd on a time-travelling journey through musical eras past, paying homage to the roots of R&B and soul music, and the artists who have impacted him musically. And although Bridges was the unmistakable star onstage, it's hard to deny the impressive skill and chemistry of his backing band. Consistently on point, the group of musicians behind Bridges played added vibrancy that perfectly complimented the already existing feel-good atmosphere. A natural performer, Bridges appeared to be having just as much fun onstage as the fans who were watching and dancing along with him.